If the universe can be represented in its entirety as data and programs then who is to say we are not living in a simulation, as in The Matrix? In the movie, human bodies are stored in silos as a power supply for intelligent machines, while the human minds attached to those bodies are preoccupied with a massive, shared simulated existence in something that seems like the real world. Actually, bodies aren’t necessary for the simulation idea to have traction. If the universe is all data and code then human minds can exist independently of bodies in the circuitry of some future electronic mega-brain. I used to think that the brain upload idea reached its appogee with Hans Moravec’s concept of an ultimate mind meld as all of nature gets absorbed into a cosmic mind bubble. But there’s more. As a thought experiment, philosopher Nick Bostrom proposed that we might now all be living in a computer simulation. If that happens to be the case, then what does it say about ethics, knowledge, memory, our relationships with one another and with nature, and other questions that preoccupy philosophers? Here’s the scenario. Thousands of years from now, our descendants, equipped with unimaginably superior technology and knowledge, and millennia of history to look back on decide to create the ultimate re-enactment of history on planet Earth. It’s like a costumed re-enactment of the Battle of Hastings, but on a computer, as in The Sims, and on a vast scale, and with a computer the size of a small planet. We are the digital inhabitants of this simulation existing millennia into the future, even though we think we are in the 21st century. Superior, future, transcendent humans (post-humans) might have several motivations for creating this simulated universe: to aid historical inquiry, as a game, a reality TV show entertainment, to learn from the mistakes and successes of the past, respect and veneration, nostalgia, etc. In his paper Bostrom assumes that such a computer would need to contain all the laws of physics, descriptions of natural systems, materials, forms, shapes characteristics, and of course the cognitive and life processes of all living things, as well as the non-living. He modifies this herculean project by suggesting that some data, such as information about distant planets, the centre of the Earth and sub microscopic entities could be at much lower resolution or generated by the simulation on “an as-needed basis” (5). Bostrom doesn’t explore this possibility, but I would have thought that simulating the cognitive capacity to dream and recall would be sufficient to keep the simulation going (as in Total Recall). But that might be too difficult for our god-like posthuman descendants to observe as they seek to understand what made their ancestors tick. In any case the hallucination of reality has to be shared by all the sims in the simulation. Unlike independent dreamers, the actions of one influence the actions of others. Of course, if you think such a simulation is vaguely plausible, you may as well entertain the possibility that our computer-savvy descendants are themselves in a simulation invented by their descendants. So there are simulations within simulations, including false starts, defective simulations (like those wonky pyramids that didn’t quite work), and alternative realities. Such fantasies play off at least five deeply ingrained contemporary cultural threads, giving them a high-tech twist. The Neoplatonic idea that there are layers to existence, with ultimate reality lying somewhere beyond our current condition in the world. The related interpretations of George Berkeley’s (1685-1753) philosophical idealism that matter and nature depend for their existence on human thought and consciousness. There are no material substances. The ancestor-simulation hypothesis also harbours the empirical view of history: that we crave the facts, the indisputable original truth about what happened years ago. If we can recreate history then at last we’ll know. Anomalies and inconsistencies in science, observation and life generally find some explanation in the idea of imperfections in the simulation. Such anomalies extend from the behaviour of particles at the quantum level to the existence of unaccountable coincidences, action at a distance, ghosts, magic, out of body experiences, and even injustices, etc. At last the universe makes sense. Then there’s infantile egocentrism that most of us grow out of. This is the child’s suspicion that he is really the only one alive or conscious, while everyone around him is some kind of automaton or actor in a play with the child as the focus. In the latter narrative, the child even wonders if they will ever catch out these actors, or discover a bevy of operatives manipulating everything behind the scenery. We see this in The Truman Show where the main character discovers that he is an actor in a reality tv programme. There’s a variant with Harry Potter and the Philosopher’s Stone, in which the unappreciated young boy finds out that he is in fact very special and has magical powers, and can access a world invisible to the mere “muggles” who live around him. That you might be living in a simulation gone wrong, or at least that you are a victim of a cosmological conspiracy presumably appeals to some. There’s a bit of an industry now affirming, playing with and debunking the simulation hypothesis (e.g. a 2013 blog by Sabine Hossenfelder). Bostrum affirmed the widely held data-code position that: “It is not an essential property of consciousness that it is implemented on carbon-based biological neural networks inside a cranium: silicon-based processors inside a computer could in principle do the trick just as well” (2). Leaving aside the question of consciousness, if you adopt the Phenomenological position of “embodied cognition” then bodies, contexts, worlds are crucial in the way we humans think, react, interact and be in the world. To deny the physicality of the world makes good scifi, but is impractical and founded on a very restricted premise of what cognition is. For me the simulation hypothesis provides a service in that it reduces to an absurdity the data-ised view of nature and of biological existence. The 2nd outcome is that it shifts our anxieties to another forum: What happens if someone pulls the plug on this simulation? Unlike in The Matrix, in this ancestor-simulation there are no actual bodies to jump back into. Though if future post-humans are clever enough to produce the simulations in the first place they are presumably smart enough to download our minds into whatever their equivalent is of bodies. But then they might not bother. It’s all just bits and bytes after all. Bostrom, Nick. 2003. Are you living in a simulation? Philosophical Quarterly, (53) 211, 243-255. Moskowitz, Clara. 2016. Are we living in a computer simulation? Scientific American, (online). Solon, Olivier. 2016. Is our world a simulation? Why some scientists say it’s more likely than not. Guardian, (online). There’s something about billionaires. Paypal billionaire Elon Musk seems to give credence to the simulation hypothesis, and wants to go to Mars. If you could hack the simulation then presumably that could shorten journey times, and reduce costs. (I don’t think he says that.) Glitches in the simulation could also explain delays and resolution issues in the case of space probes. After all, the simulator has to change its resolution as a probe gets closer to the planet’s surface. 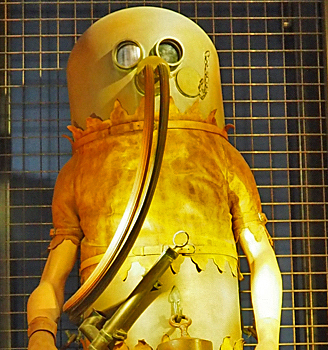 The picture above is a diving suit in the Oceanographic Museum of Monaco (Monte-Carlo). Roboticist Hans Moravec thinks we all patterns. Once they are replicated in a computer then that’s us. See post The singularity paradox, adapted from Coyne, Richard. 1999. Technoromanticism: Digital Narrative, Holism, and the Romance of the Real. Cambridge, Mass. : MIT Press. Bostrom also proposes that the simulation we are in will stop for us when the simulator gets switched on, or some time before, i.e. when we become posthuman. After all, there’s no point in an ancestor-simulation that includes the present moment: “we should expect our simulation to be terminated when we are about to become posthuman” (12). For a definition of posthuman see post What’s wrong with posthumanism. « What does architecture represent?